Big Buck Bunny, We Want More! Blender Institute, part of the Blender Foundation, made another animated open content film entitled Big Buck Bunny. The short movie is created using only free and open source software. According to Ton Roosendaal, producer and Blender Institute director, the primary intent of the film was to stimulate the development of open source 3D software, but the quality of Big Buck Bunny on an artistic level as well as on technical ingenuity is what you would expect from large animation studios. I watched Big Buck Bunny yesterday together with my 3-yr old son. While Elephant's Dream has a darker storyline, Big Buck Bunny is the complete opposite. It is fun-filled, and the characters are indeed very entertaining to watch. 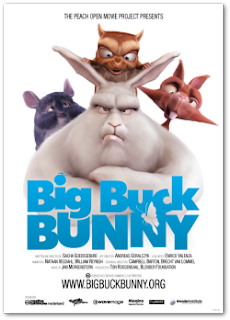 The movie is actually about a well-tempered rabbit named Big Buck who is bullied by three rodents. The fun begins when Big Buck decided to take revenge. Big Buck Bunny - Official Trailer from Andy Goralczyk on Vimeo. You can download the whole movie files HERE. It's all yours for free. A little geeky note: Images of the film were rendered on Sun’s Grid at Network.com. See how it works HERE. The movie is stunning indeed. I think this looks better than Elephant's Dream. What do you think? I hope there will be a series of releases for Big Buck Bunny coming real soon.